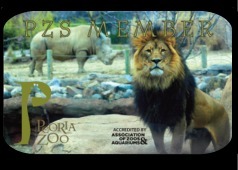 Peoria Zoo GIFT MEMBERSHIPS are a great gift that last all year long! You can purchase a gift membership online by accessing our Park District PayPal form here. Your membership will pay for itself in just a few visits-what are you waiting for? Sign up online utilizing the links below! You can also sign up at Peoria Zoo, or over the phone by calling (309) 681-3500! Your Membership will pay for itself in just a few visits- what are you waiting for? Free or discounted admission to over 150 zoos and aquariums. 10% discount in the Zoo's Safari Gift Shop. ZooTales, the PZS member newsletter. Special member prices for select Zoo events and programs. Early admission during monthly Member Mornings. PLEASE NOTE: Memberships are non-transferable and non-refundable. Membership processing can take up to 30 days from the date of purchase. Memberships are based on one household (same home address) for cardholders. All memberships are valid for one year from the date of purchase. Unlimited visits for person named on the member card, no dependents over the age of 1. Unlimited visits for 2 adults, no dependents over the age of 1. Unlimited visits for up to 2 adult card holders and their children under the age of 18. Unlimited visits for up to 2 grandparent cardholders and their grandchildren under the age of 18. A Family Membership plus the opportunity to bring one guest per visit; member cardholder must be present for guest entry. A Grandparent Membership plus the opportunity to bring one guest per visit; member cardholder must be present for guest entry. A Family or Grandparent Membership and five one-time entry guest passes. A Family or Grandparent Membership, plus the opportunity to bring two guests per visit (member cardholder must be present for guest entry), and five one-time entry guest passes. A Family or Grandparent Membership, plus the opportunity to bring two guests per visit (member cardholder must be present for guest entry), ten one-time entry guest passes and a custom animal painting. A Family or Grandparent Membership, plus the opportunity to bring two guests per visit (member cardholder must be present for guest entry),ten one-time entry guest passes, custom animal painting, and a personal behind the scenes tour. For information about Caregiver Memberships, please call the Membership Office at (309) 681-3500. Peoria Park District offers many membership choices, including membership packages. Whether you want to take a walk on the wild side at PEORIA ZOO or create and explore at the PEORIA PLAYHOUSE CHILDREN’S MUSEUM. Nature lovers will find endless activity and resources at FOREST PARK NATURE CENTER and LUTHY BOTANICAL GARDEN. GOLFers will get more “fore” their money with a season golf pass. The Peoria Park District also offers affordable opportunities to get in shape, too… both at the RIVERPLEX and at our neighborhood recreation centers.